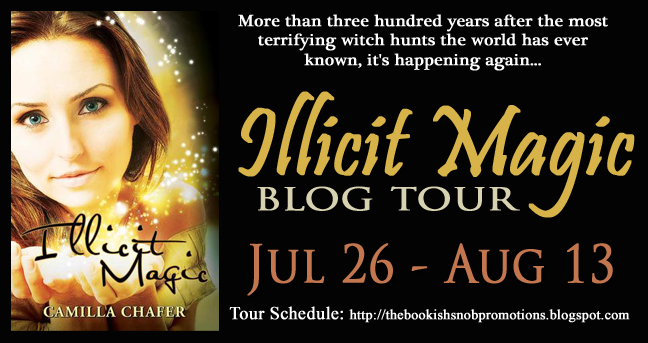 Reader Girls is the host today for the Illicit Magic Blog Tour hosted by The Bookish Snob Promotions. 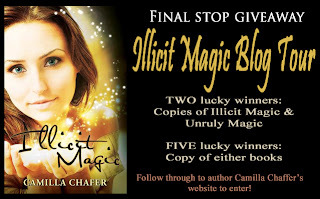 We welcome author Camilla Chafer, author of Illicit Magic (Stella Mayweather #1), to our blog. 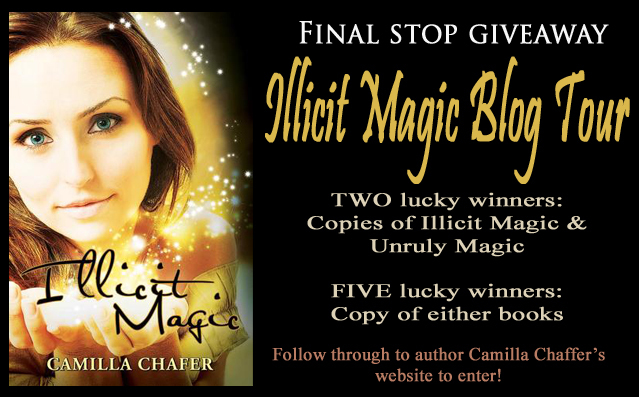 Camilla Chafer will also provide an ecopy of her book to one lucky reader so please leave a comment below to enter. Book blurb: More than three hundred years after the most terrifying witch hunts the world has ever known, it's happening again. 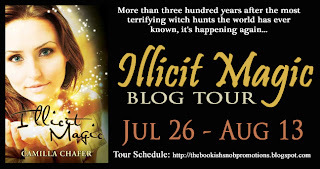 Young witch, Stella, has to put her faith in strangers just to stay alive but she might not be any safer in their midst than from the danger she is running from. There is more than one dark secret in her new family: Étoile’s sister is spoken of in fear and sadness; Marc is supposed to be a powerful witch but is missing his magic; where does the owner of their safe house vanish to every day and why does Evan have the eyes of someone not quite human? There is only one secret that someone will do anything to keep quiet, but whose secret is it and will Stella have to pay the price for silence? Étoile had glided towards the hallway door and had her head cocked to one side again. When she looked at me briefly, I couldn’t tell if she was impressed that I’d managed to pack in under ten minutes flat or surprised that I really had so little. “They’re nearly here but they’re confused. They haven’t decided what they are going to do yet,” she breathed. Her eyes had an unfocused faraway look and her voice was just loud enough for me to read an undercurrent of fear. She didn’t strike me as someone who normally broke into a sweat when under pressure so that note of fear had me concerned. “Have you got everything?” she asked, hurriedly nodding towards the bag. I scanned the room. I had my clothes, shoes and jewellery bits in the bag. I had taken nothing from the bathroom. “Toothbrush,” I said and made a move towards the damp bathroom. It was the best move I could have made. The fiery missile that exploded through the window and breezed into the room in a gush of wet air was just a whisper from my face and I felt the rush of heat as it whistled past me to thud on to my sofa bed. Glass fragmented in its wake, shards sucked into my room with the force of the sudden rush of oxygen, and I shrieked in terror, throwing myself towards Étoile who caught me with steady arms. Flames erupted on the bed and the smell of petrol leaked into the air from the crude weapon. I pushed myself free from Étoile and grabbed my duffle bag before it was consumed in the eager flames. I started towards Étoile and she grabbed my hand to tug me away from the flames as a loud crash sounded at the door. We wheeled around to see the wood splinter as the head of an axe crashed through. Étoile spread her arms behind her to reach for me. Alarm bells sounded in my head as danger approached us from every angle, cutting off both of our escape routes. I could hear cries erupt from the street below and anger from the hall. The cruelty carried itself through the air and seeped all around us. I knew in that moment that this was what real terror felt like. Étoile had the foresight to grab my shoulder bag from where I had dumped it when I came in and was edging closer to me, my body between hers and the flames. They were already billowing black smoke. Now we were half facing the door that in just four strokes was almost shattered. A hand reached through and stubby fingers grappled with the flimsy lock. “We have to go now,” Étoile cried, catching my hand and gripping firmly. 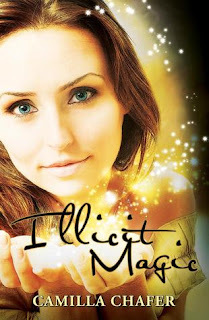 Hi, I'm Camilla and I'm the author of Illicit Magic and Unruly Magic, the first two books in the Stella Mayweather Paranormal Series. The series starts with a lonely young woman, Stella, who has been caught up in a terrifying witch hunt and is whisked thousands of miles away to what she thinks is safety to learn her craft. The series is a blend of magic, mystery and romance with a splash of humour - and while the girls really do go all out to save themselves, there's always a hunky guy or two on hand to help them out. The author is also giving away one ecopy to one lucky commenter below. This contest will end on August 3rd. Sounds good. This is the first I have heard of it. Thanks for sharing! I love stories about witches and definitely will look into this. I was on the fence until I read the blurb, then I hopped it and jumped into the excerpt. I'm so glad I did! This sounds REALLY good. Best of luck to Camilla. I'll be looking for this novel! This story sounds great! And I'm lovin the beatiful cover. This is great!! thanks for the giveaway!!! I love the cover. Thanks for the chance.